Sometimes she has the attention span of…. Oh look, a squirrel! With the holidays fast approaching, and many children’s movies premiering, we have been considering taking our 2 ½ -year-old daughter to a movie theater for the first time. I’m apprehensive about her attention span, which often appears to be about that of a butterfly, though she has been improving since beginning preschool. Keeping her seated throughout an entire family meal, for instance, is a constant battle, as is sitting through a church service. The topic of short attention spans does not escape my dog loving friends, either. While older dogs may be able to focus in on things for longer periods, younger dogs are often flighty and it can be a challenge to maintain their focus. 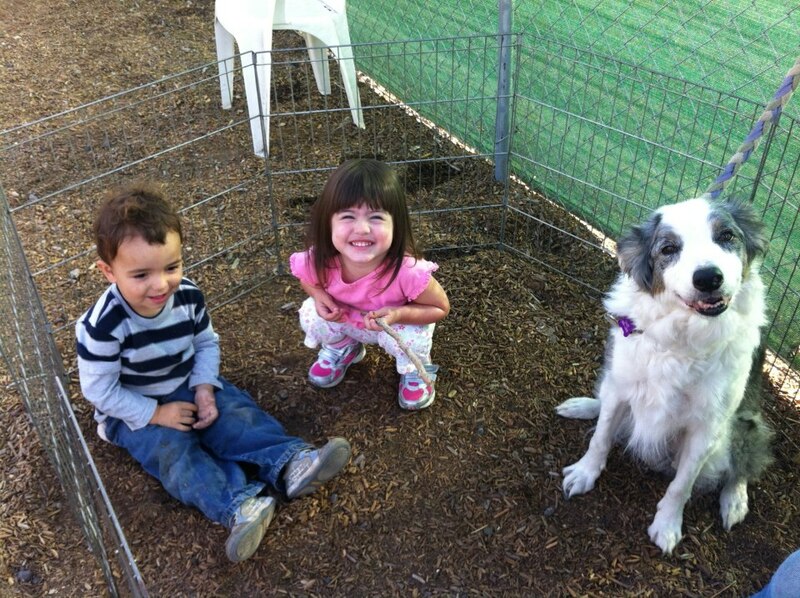 Put young children together with young dogs and the challenge more than doubles! 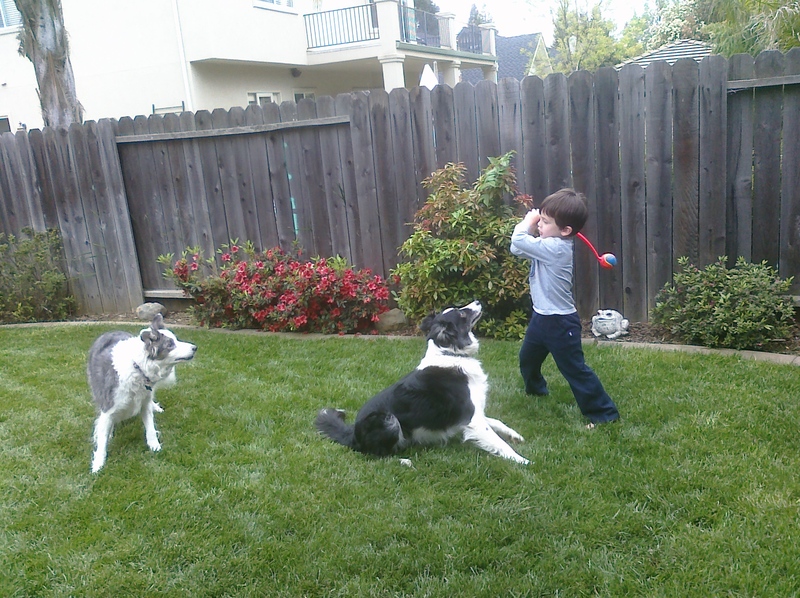 Fetch is a great way to capture kids’ and dogs’ attention. To my students, I recommend that they keep their dogs’ training sessions to a maximum of 3-5 minutes in length. While many dogs can concentrate for longer than that, the majority – particularly the younger dogs – start to show what we call “displacement behaviors” such as scratching at imaginary fleas, or suddenly finding some interesting smell on the ground directly in front of them when they are feeling overly pressured. Additionally, for the dog to want to work, it is ideal to keep sessions short, leaving the dog wanting more, rather than working them to mental exhaustion. Similarly, time outs, for those who use them, should also be relatively short. For a child, it is recommended to time them out for as many minutes as their age in years. For dogs, a 30-second to 2-minute time out suffices. Given that dogs are estimated to have the intelligence of approximately two-year-old children, this certainly makes sense. But what about working with children and dogs together? When I take my daughter to sports practices such as agility and flyball, I make certain to bring a variety of toys along to keep her entertained. For while she loves watching the dogs work, she can only focus on them for so long before she becomes bored and looks for other things to do. So I do my best to divide my time between her and the dogs so that I can keep everyone appropriately occupied throughout the training sessions. As mentioned above, to teach my dogs to increase their attention spans, I try to leave them wanting more of the things that I like to do with them, such as flyball, agility, and tug games. I’m not certain that this will work with a toddler, but it is a harmless tactic that may be worth a try. Meanwhile, I’ll monitor her attention span, along with my dogs’, and attempt not to bore them all too much with my desire to keep on working. This entry was posted in Behavior, Training by C. Bookmark the permalink.